A QuickBooks CRM is one that integrates with QuickBooks and helps businesses by consolidating customer and accounting information in one interface. We examined several options to identify the top six based on criteria like direct QuickBooks integration, ease of use, alerts, and notifications in order to arrive at the overall best solution for small businesses. CRM software that integrate with QuickBooks help save time by reducing the need for double accounting entries and by providing payment and invoice information for salespeople. When considering the best options, our criteria included affordability, ease of use, direct integration, and customer support, all of which help you strengthen your sales cycle and provide a better customer experience. Price/Affordability – We looked at the pricing of several QuickBooks CRMs and included the ones most small business owners would consider to be affordably priced. Ease of Use – We evaluated how easy it was to use the QuickBooks CRM integration features and included options that business and sales managers would find easy to use. Direct/Ease of Integration – We included options with an easy and direct integration process. Invoice Views, Filters & Summaries – We looked at features that allow users to filter invoices and view individual invoices as well as invoice summaries to gain a quick snapshot of financial information. Invoice & Payment Search – We looked at whether or not you were able to search and find invoices and payments in the CRM with the integration. Alerts & Notifications – We considered options that included alerts and notifications about billing, payments, and invoices that sales professionals and business managers would find useful. Customer Support & Educational Resources – We also looked at the type of support and educational resources each provider offered around QuickBooks integration. Based on this criteria, we have determined Method CRM to be the overall best CRM that integrates with QuickBooks. The biggest advantage is that it offers direct integration with both versions of QuickBooks, so more CRM users can benefit. You can also create customer portals where customers can view their transaction history and pay invoices. It is affordably priced starting at $25/user per month. Method CRM is the overall best CRM for QuickBooks because it offers customer portals and direct payments as part of its integration. These features allow companies to get paid faster as well as improve the customer experience. It’s unique because it accommodates both QuickBooks online and desktop versions and offers a self-serve customer portal, making it a good option for companies wanting to free up their sales team from processing payments. Method CRM is affordably priced, with only two main price points at $25/user per month and $44/user per month. It offers affordable add-on features like the ability to create vendor purchase transactions, email campaigns, and case management, for $10/user per month for each feature. Contact Management is the starter version priced at $25/user per month. You can track contacts, send emails, create follow-ups, and share calendars. Its unique feature is the ability to create customer self-serve portals, where customers can view transactions and make payments. Beginning with this plan gives your sales team access to basic CRM functionality with features like the customer portal, which makes it easier and faster to get paid. For additional CRM features like email campaigns, adds-on are available for $10/user per month. This plan is best for companies that want to facilitate customer self-service and incorporate QuickBooks data and transactions into their sales and CRM process. Starting at $44/user per month, the CRM Pro plan builds on the Contact Management plan and offers more features, including the ability to create and manage invoices, quotes, and sales orders, and you can accept online payments. It builds on the CRM features and functionality by allowing you to build sales pipelines where you can create, track and assign opportunities and capture prospects with web-to-lead forms. The CRM features in this plan are not as robust as the more advanced plans we looked at in this article, as it is lacking tools like lead scoring, project management and email campaigns without the need for an add-on. It does, however, offer pipeline management with more sophisticated payment options. It is, therefore, best for businesses looking for tools that focus on getting paid faster. Method CRM is missing advanced CRM bells and whistles like lead scoring, project management, and a built-in phone. It’s also missing the out-of-the-box ability to create and execute email campaigns. If these tools are important, you may want to consider Freshsales or Insightly, which both offer these types of features but have QuickBooks Online integrations that are not as sophisticated as Method’s. Method CRM users generally like the software, especially for its advanced QuickBooks features, level of customization, and support. Dislikes fall under the category of some CRM-focused features not being robust enough. For more information on reviews, see our Method review article. 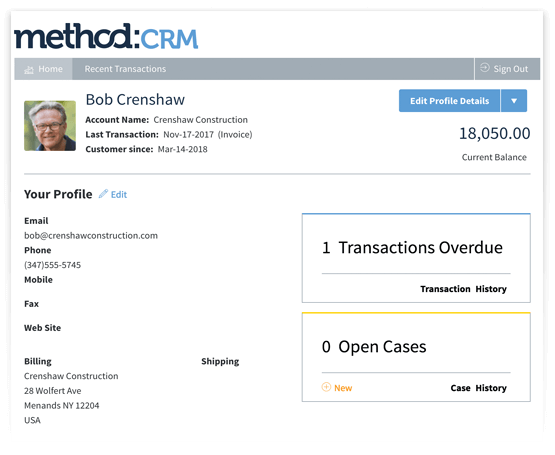 Business owners that need a solid, no-frills CRM that also has sophisticated QuickBooks integration focused on payments should check out Method CRM. They offer a 30-day free trial to evaluate their features to see if they’re right for your business. Visit Method today to learn more. Freshsales is a CRM that integrates with QuickBooks online and allows you to pin or connect invoices to contacts, which is helpful in identifying billing issues with customers. What makes it unique is its built-in phone system that conveniently allows business managers to quickly follow up on any invoice issues. Therefore, it is a good option for salespeople who rely on outbound calling and are responsible for or influence sales activities from prospecting to billing. Freshsales’ pricing ranges from $12/user per month to $49/user per month for plans geared towards small businesses. There’s also a free version that offers basic lead and contact management functionality for unlimited users, but it doesn’t include QuickBooks integration. All paid plans come with QuickBooks integration. The Sprout Plan is Freshsales’ free version, which means that while it offers helpful CRM features like a built-in phone with call recording and basic lead scoring to make salespeople more productive, it does not offer the more advanced features found in the paid versions. It also does not include QuickBooks integration. This eliminates the Spout plan as a CRM for QuickBooks use within the CRM’s user interface. However, the plan is still a good option for teams ramping up and focusing on new business and those that rely on calling for prospect outreach. This plan builds on the Sprout plan and provides more advanced CRM tools, including direct QuickBooks online integration. With this integration, businesses can view invoices, pin invoices to contacts, get payment alerts, and search for invoices, all within Freshsales. Starting at $12/user per month, this plan also includes more sophisticated CRM features like advanced lead scoring, workflow automation, expanded bulk emails, and advanced reporting. QuickBooks integration features like payment alerts and linking invoices to contacts allow businesses to influence customers from the beginning to the end of the sales cycle. The Blossom plan is comparable to Insightly’s starter paid plan, but at a lower price point. 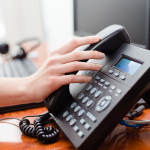 It is best for salespeople and business owners who want to positively influence customers in the billing portion of the sales cycle as well as those who depend on phone outreach. Starting at $29/user per month, the Garden plan expands on the Blossom plan, which includes direct QuickBooks integration. It also offers forecasting features, lead scoring by email activity, lead assignment rules, more automation workflows, and call forwarding and transfers. It is similar to Insightly’s Professional plan, which is priced at $49/user per month, with its workflow and lead scoring functionalities, but offers calling features not available with Insightly. Features like workflow automation and QuickBooks payment alerts allow salespeople to stay on top of invoice status and communicate with customers accordingly. These tools can trigger reminders for salespeople to take action when they’re made aware of invoices either being paid or not, motivating customers to take action. This plan is, therefore, best for businesses that want to create processes around getting invoices paid faster. The starting price for the Estate plan is $49/user per month. In addition to QuickBooks integration with the same features as the other paid plans, this plan offers expanded sales campaigns, lead scoring, and bulk email capabilities. However, Insightly allows you to execute bigger email campaigns by enabling you to send five times as many emails. The ability to send bulk emails, create sales campaigns, and create lists by invoice activity can allow sales professionals to create a customer-centric campaign that motivates customers to pay invoices or make additional purchases. The Estate plan is therefore great for businesses with a larger customer base and that want to approach customer payments and additional business in a more proactive, customer-centric, and strategic way. Freshsales is missing the ability for customers to log into a customer-facing portal, manage their account and make payments. It is also missing the ability to create invoices. If these are important features, Method would be a better option. Freshsales users find it easy to use with great support. User dislikes usually fall into the category of minor glitches or occasionally, the system running slowly. For more information on reviews, see our Freshsales review article. Sales professionals looking for a CRM that integrates with QuickBooks online and that will allow them to connect invoices with contacts and follow up with a built-in phone should check out Freshsales. Visit Freshsales today and sign up for a 30-day free trial. Insightly is a CRM with QuickBooks Online integration, project management features, and prospecting tools like the business card scanner, starting at a free price point. These features, along with QuickBooks integration, offer additional data points and efficiencies that can be used to improve the customer experience, making it great for project-oriented businesses like IT service providers. Insightly is affordably priced, starting at $29/user per month. As your needs grow and you require more advanced tools like workflow automation and role-based permissions, prices are still affordable at $49/user per month. There’s also a free version for up to two users that does not include QuickBooks integration. The Free plan offers the same core set of task, opportunity, relationship, and project management functionality as the paid plans. Where it differs is that only two users are allowed on this plan, and there are a lot of limitations on the size of data storage and record imports. Features are comparable to the free version of Freshsales, which includes not offering QuickBooks integration. The Free plan is a great starter option that is scalable when your business expands its team. It is also the best choice for small businesses with a maximum of two users looking for a tool that consolidates the complete customer management experience from prospecting to project management. However, its lack of QuickBooks integration eliminates it from consideration as a QuickBooks CRM. The Plus plan offers the free plan’s features and has some additional ones, including QuickBooks Online integration. This allows you to view invoices and payments, link invoices and payments to contacts, opportunities, and deals, and keep up with due dates. There are not as many limitations or restrictions as there are in the free plan, and it’s priced starting at $29/user per month. Record, storage, and email limitations are also significantly increased. This plan is great if you need to accommodate more records and a larger sales team. It’s also good if you require more file storage. Insightly’s Plus plan is the best option for sales managers looking to build on the Free Plan and want to take advantage of QuickBooks integration features. The Professional Plan, at $49/user per month, offers sales professionals more storage and number of records. It also provides tools and resources not available on the Free and Plus plans, like workflow automation and lead assignment. Similar to Freshsales at this level, sales professionals can combine the ability to create workflows with billing and payment data from QuickBooks to consistently stay on top of and manage open invoices. Lead assignment, role permissions, workflow automation, and QuickBooks integration increase productivity and help sales teams remain focused by putting the most important information in front of them and guiding their customer interactions. More mass emails and email templates will also enhance productivity and improve customer communication. This plan is best for companies aiming to increase and scale productivity and improve customer experience. Insightly is missing the ability to create invoices and estimates. It is also missing a customer portal that accepts direct payments. If these features are important, Method CRM is a better choice. Insightly users love the project management features. They like being able to stay involved with customers after a deal closes. They also think training and onboarding for new users could improve. For more information on Insightly user reviews, see our Insightly review article. If your business could benefit from a CRM that has project management tools and integrates with QuickBooks, consider Insightly. It allows you to build long-term customer relationships while staying focused on the most important activities throughout the entire sales life cycle. You can sign up for an Insightly free trial to see if it’s right for you. Agile CRM acts as a single platform to manage sales activities, accounting, support, and marketing automation, starting at $8.99 per month. 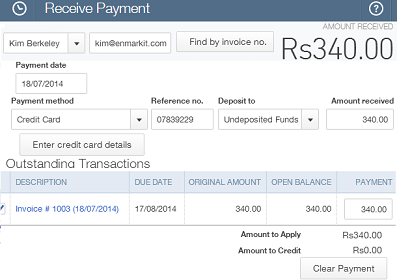 It offers an end-to-end CRM that includes QuickBooks integration, where you can create invoices and receive payments. Performing diverse tasks like managing your pipeline, creating landing pages, and setting up automation sequences makes it a great option for companies looking to automate their accounting and marketing initiatives. Agile CRM is affordably priced, ranging from $8.99 through $47.99. There’s also a free version for up to 10 users that is feature-rich but has fewer features and more restrictions than the paid plans. QuickBooks integration can be used with the free plan if you choose it as your one integration option. The Free plan offers contact management with 360-degree views of customers. It also offers lead scoring to keep sales teams focused and advanced marketing features like e-newsletters, landing pages, and mobile marketing. 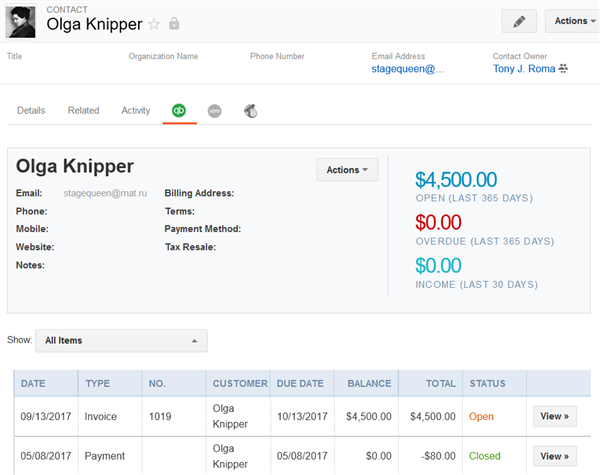 Unlike the free version of Insightly or Freshbooks, it also includes QuickBooks features like creating invoices, tracking and receiving payments, and viewing invoice history. This plan is great for businesses just starting out and can easily scale as you grow. For businesses with 10 or fewer team members looking for robust QuickBooks features, advanced marketing tools, sales management software, and a help desk solution, this is the best option. The Starter plan builds on the Free plan, offering an expanded number of contacts, two-way email integration, three plug-ins/integrations versus one, and a landing page builder. Having more than one integration allows you to incorporate QuickBooks integration alongside other integrations needed to run your business. It’s comparable to most of the other CRMs included, but at a lower price point. Priced starting at $8.99/user per month, the Starter plan accommodates growth, expanding the number of contacts from 1,000 to 10,000, and offers more advanced tools like marketing automation, social monitoring, and a knowledge base, which enables Agile customers to offer content-based support to their own customers. This plan is great for companies with a large number of contacts, need more sophisticated marketing tools, and want to offer a knowledge base. The Regular plan builds on the Starter plan, offering more features like mobile marketing, custom deal tracks, and two-way telephony. Features like mobile marketing and QuickBooks integration can allow you to create mobile campaigns to communicate with customers about their account status. This plan is comparable to similar plans of other CRMs but does not include a built-in phone, as offered by Freshsales, or a customer portal as offered by Method CRM. Priced starting at $29.99/user per month, the Regular plan expands the number of contacts from 10,000 to 50,000 and offers more integrations (from three to 50+). This plan is great for companies that have expanded their number of contacts, would like to incorporate mobile marketing into their outreach strategy, and want two-way telephone features. The Enterprise plan builds on the Regular plan, offering unlimited contacts, a dedicated account rep, and onboard coaching. This plan is great if you want or need more support. Its level of CRM robustness is comparable to the other CRMs included, but offers expanded support for a much lower enterprise price point. Priced starting at $47.99/user per month, the Enterprise plan expands the number of contacts from 50,000 to unlimited and offers 50+ integrations/plug-ins like the Regular plan. It also offers onboard coaching, which can increase adoption and decrease new hire ramp-up time. This plan is a great option for growing companies that want to streamline their onboarding process and take advantage of unlimited contacts. Agile CRM is missing a built-in phone system, a business card scanner, and a self-serve customer portal. If these tools are important, you should consider Freshsales for built-in phone features, Insightly for its business card scanner, and Method for self-serve payment options. Agile CRM users like that it’s easy to use and also the number of available integrations. The negative reviews for this product were around glitches or features users felt could have been built out more. For user reviews, see our Agile CRM reviews article. Businesses looking for an all-in-one CRM with robust QuickBooks integration features, robust marketing features, and great help desk features should check out Agile CRM. You can try it out for free for up to 10 users. PipelineDeals is a CRM with QuickBooks integration that allows you to manage teams and enhance productivity with workflow automation. 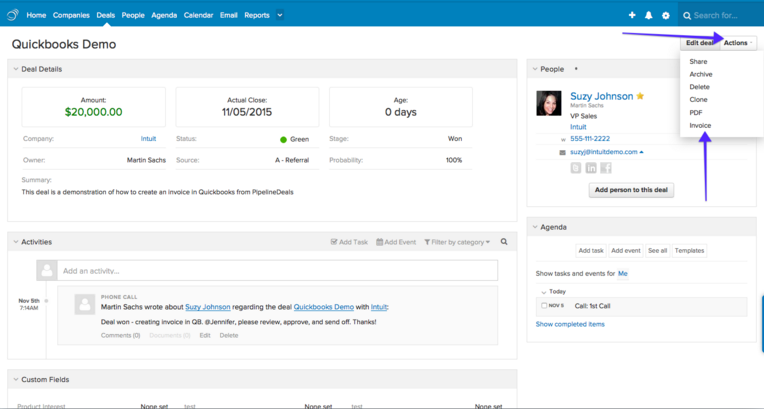 You can set up users by role, group them into teams, and automate repetitive sales tasks. 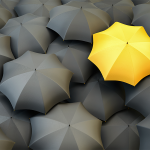 What makes it unique is a customizable customer health score, where you define and communicate the health of your customer relationships. It’s great for highly competitive industries where you must proactively address relationship issues. PipelineDeals pricing ranges from $25 to $49/user per month, billed annually. They keep pricing simple, offering three tiers to accommodate startups and established businesses. They also offer a 14-day free trial, where you can try the features to see if they are right for you. With prices beginning at $25/user per month, the Start plan offers unlimited leads, contacts, and deals. It also allows you to create custom deal stages and unlimited customizable dashboards and reports. QuickBooks integration lets you create invoices and manage invoices that sync with PipelineDeals and QuickBooks, store invoices, and access data like payments and estimates. This plan offers a robust CRM with QuickBooks integration features that go beyond viewing and tracking invoices. It’s a great option for businesses that want to manage the entire relationship within their CRM and need the ability to create and send invoices. It’s comparable to Method CRM in terms of price and basic QuickBooks features, but lacks the customer portal and payment features that Method has. This plan starts at $33/user per month and builds on the Start plan. It offers project management features including the ability to track milestones, updates, and status. It also lets you define and communicate account health and lets you customize revenue types. The Develop plan gives you more advanced tools to nurture customer relationships. Its project management tools aren’t as robust as Insightly’s, but can work for companies that only need the basics or don’t want to fully manage projects within their CRM. This plan is great for companies that want to nurture customer relationships post-sale with project management information and use QuickBooks features to manage the billing process. Priced at $49/user per month, this plan builds on the Develop plan and offers more advanced features, including email automation and campaigns, task automation, and sales intelligence. Task automation works nicely with QuickBooks integration, allowing you to automate the transition from closed deal to invoicing. This plan is feature-rich but lacks many of the bells and whistles of Freshsales at this level, where you get a built-in phone and advanced lead scoring. The Grow plan gives you the tools to work more efficiently and intelligently. It’s great for established teams with lots of repetitive sales tasks that could benefit from task and email automation. PipelineDeals is missing advanced billing features like the self-service customer portal that Method CRM offers. It’s also missing advanced lead prioritization tools like the lead scoring functionality offered with Freshsales or advanced project management features offered by Insightly. If these are important, you should consider these other providers. PipelineDeals users love that it’s easy to use and is very affordable. They also love the integrations, like the QuickBooks integration. Negative reviews are around small bugs or glitches. For more information, see our article on PipelineDeals reviews. If you’d like to try a CRM that allows you to manage sales teams, is customizable, and has unlimited dashboards and QuickBooks integration, check out PipelineDeals. Its simple pricing tiers and risk-free, 14-day trial make it easy to find a plan that fits your budget. Learn more by visiting its website. Vtiger offers a cloud-based CRM and an open source desktop CRM. We chose the cloud version for this article because it’s easier to use and manage and comes with QuickBooks integration. CRM features include profile scoring, email marketing, and phone with recording features. It also offers a kanban-style view of deals and even offers a help desk plan, which is great for businesses that offer ongoing post-sale support. Vtiger is competitively priced, starting from $10/user per month to $20/user per month. It offers three types of plans: one that is sales-focused, one that is help desk- or support-focused, and one that includes both plans. We will focus on the sales-focused plan for this article. Starting at $10/user per month, this plan offers a feature-rich CRM that includes contact management, task management, email tracking, social media integration and lead capture, and workflow automation. It’s comparable to the other full-featured CRMs but at a lower cost. However, this plan does not include QuickBooks integration. The Sales Starter plan allows you to manage sales and marketing activities but doesn’t allow you to do things like creating invoices or tracking payments. This is a great option for businesses interested in a low cost, feature-rich option, but the lack of QuickBooks integration does eliminate the plan from being considered a QuickBooks CRM. Priced at $20/user per month, this plan builds on the Sales Starter Plan, offering QuickBooks integration that provides the ability to create invoices. It also offers two-way email sync with Gmail, Twitter integration, lead capture, and profile scoring. This plan is similar to Agile CRM but at a slightly lower price point. The features in this plan allow you to carry out more advanced sales and marketing activities while allowing you to participate in the billing management process. It is best for sales professionals looking for a low-cost way to build comprehensive customer and prospect relationships. Vtiger lacks the more robust features, like project management, in both its Starter or Sales Pro plans. 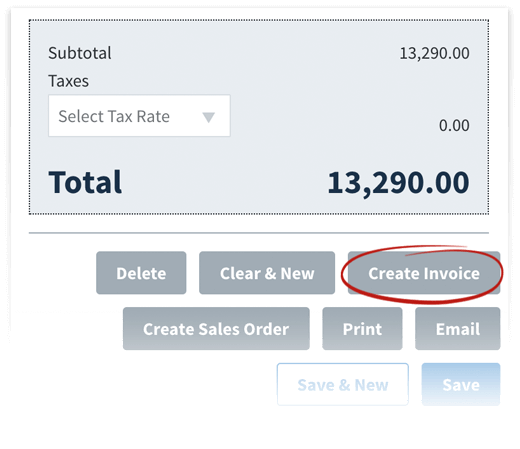 If this feature is important to you in addition to QuickBooks integration, consider an alternative like Insightly or PipelineDeals. It also lacks the ability to give customers a self-service payment portal, as offered by Method CRM. Vtiger offers both an open source desktop CRM and a cloud-based CRM. However, we only covered the cloud version in this article because it’s easier to use. People love the cloud version because it’s easy to use, has great customer support, and is inexpensive. A few negative reviews have centered around too many options or features. See our review article on Vtiger. If you’re looking for a comprehensive CRM with QuickBooks integration and with a kanban view of deals, check out Vtiger. They offer a 14-day free trial. Sign up today to get started. The best CRMs that integrate with QuickBooks are easy to use, offer direct integration, and offer the ability to view, access, and manage invoices. Whether you’re looking for one that allows you to give your customers self-serve options or one that offers advanced marketing tools, we’ve covered a CRM that will work for you. Our overall choice for the best CRM with a QuickBooks integration is Method CRM. They offer a 30-day free trial to evaluate their QuickBooks compatibility to ensure it’s right for your business. Visit Method today to learn more about their product.